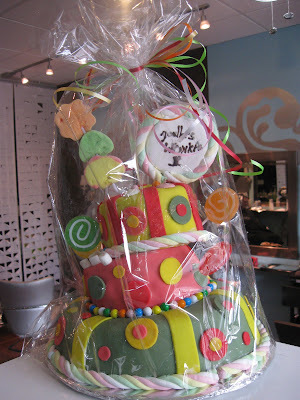 Bijou - A gem of a little salon in Skaneateles: The big ticket item for the Bake Sale on Saturday! The big ticket item for the Bake Sale on Saturday! Joelle from the wonderful Joelle's bistro made this for our bake sale! It's an amazing topsey turvey willy wonka cake!!!! All created by Joelle herself! In case you are one of the FEW people who have never made it there...don't deprive yourself any longer! Go there! And if this cake entices you, come to our bake sale, Chloe and Henry will be waiting at the table to sell you goodies! All proceeds going to Environmental advocates of New York!